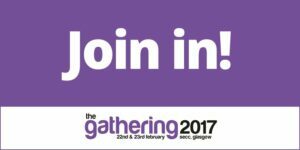 This year our Events and Fundraising Officer attending The Gathering 2017. I love charity was the theme of this year’s Gathering because SCVO believes Scotland’s third sector deserves a bit of love. The Gathering organised by SCVO is Scotland’s unique event that brings together all parts of the third sector, with 3000+ visitors it is the largest event of its kind in the UK. The Gathering incorporates an exhibition and marketplace with over 100 exhibitors, as well as a packed events programme including over 50 workshops and seminars led by voluntary organisations, social enterprises, government, the media and companies who work with and alongside the sector. 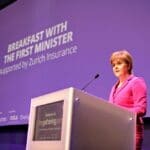 A breakfast meeting with the First Minister opened the event and the whole event was a great opportunity for us to meet and learn from some of the best people working in and representing Scotland’s third sector.